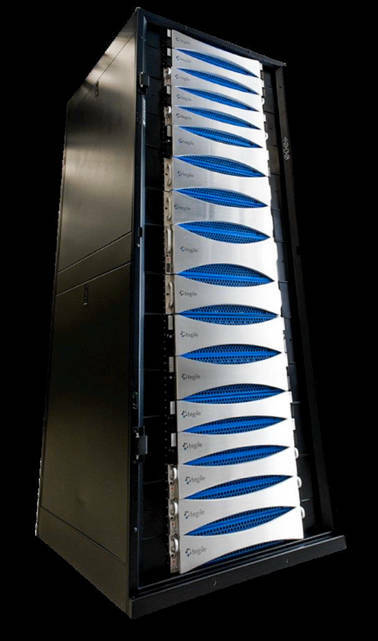 Effectively Tegile's second-generation AFA, the IntelliFlash HD is a scale-up and scale-out array offering, Tegile says, up to 5 million IOPS and scaling from 10TB to 10PB capacity in a single rack. Tegile says its IntelliFlash HD provides 8X controller bandwidth, 8X storage density, 8X latency reduction, and 8X capacity scalability over its current flagship AFA, the T3800. It's achieving this by "adding scale-out controllers, [N]VDIMM flash, and an extremely high-density flash layer." There's no detailed configuration info yet and we tripped up trying to work some of the math here. The density is 512TB in 3U using SanDisk InfiniFlash enclosures and flash cards. This, expressed as 170.6TB/U, is apparently not that much different from the T3800's 168TB/U, assuming that the T3800's 336TB is in its 2U base unit. Wrong assumption, as Tegile marketing VP Rob Commins explains: "The 336TB is raw for 8U of gear. The base T3800 has 48TB in 2U and has 2 expansion shelves of 144TB each in a 3U package, yielding 42TB raw per U." So then "The 8X comes from 512TB/3U=170.6 versus the base 44TB/2U=22 T3800 configuration. 170.6/22 = 7.7X. A little marketing rounding gets me to 8X." And there you have it. We calculated there can be 14 3U IntelliFlash enclosures max in a 42U rack and that gave us 7.168PB and not 10PB. What gives? Commins explains again: "In a 42U rack, we need 18U for controllers and top of rack switch. That leaves 24U, allowing up to 8 3U boxes for capacity. 8*512=4096. We then applied a 3X reduction rate and shaved 20 per cent off for RAID. Gets to 9.8TB. I rounded for marketing purposes." So it's 10PB of effective capacity and 4.096PB of raw capacity. The price is a sweet <$0.50/effective GB. Doing the math, we get 10 effective PB = 10 million GB and at c$0.5/GB = approximately $5 million for a 10 effective PB IntelliFlash HD rack. That beats Kaminario's v5.5 K2 AFA with its less-than $1/effective GB pricing. And that box is using SamSung TLC 3D NAND and not SanDisk's planar NAND as Tegile does. This is a useful OEM win for SanDisk's InfiniFlash JBOF (just a bunch of flash) box. Stifel MD Aaron Rakers reminds us SanDisk is an investor in Tegile. Supermicro is the server supplier. Tegile claims its new box brings hyperscale performance and economics to the enterprise data center. It supports high-performance flash or high-density (capacity) flash, or a combination of both. The pricing above would be, we assume, for the high-density flash version. We think it is the first 2-tier all-flash array, and that might be hard for pure (pun intended) all-flash array vendors with single-tier environments to replicate. The IntelliFlash OS supports snapshots, clones, thin provisioning, inline deduplication and compression. It has VMware integration via SRM, VAAI, VASA, and VVOLs and provides unified block (FC, iSCSI) and file (NFS, CIFS/SMB3) access. The product can replicate data to Tegile's hybrid arrays, Tegile saying this provides affordable disaster recovery. It says its new product is good for latency-sensitive applications (obviously) and also use cases such as "large data warehouses, analytic applications, big data processing, image processing, and large private clouds that require economical acceleration of performance." Tegile CEO Rohit Kshetrapal says the product is in line with Tegile's mantra of one flash platform for any workload – a kind of universal flash array.